Ahead of next Tuesday’s 2018 NAB AFL Women’s Draft, we’ve previewed the best female footballers who could land on the Brisbane Lions list. 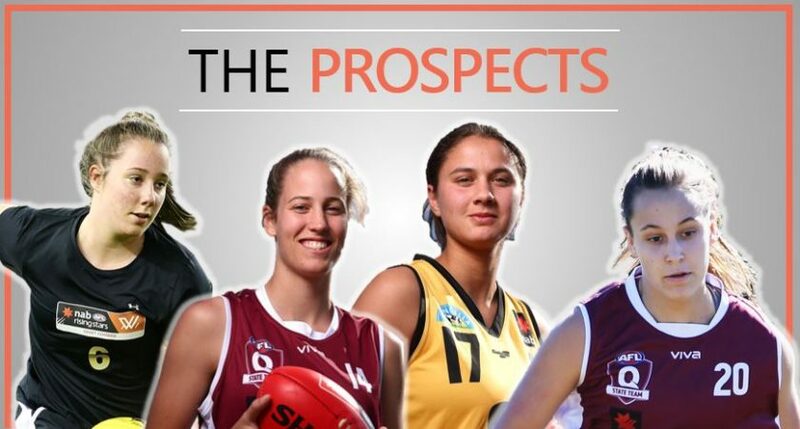 This year, the Brisbane Lions hold eight selections in the draft and can select their players from the pool of Under 18 talent born in the year 2000 who have nominated Queensland as their state of choice as well as the crop of players from the QWAFL. With the Gold Coast SUNS also set to join the AFL Women’s competition ahead of the 2020 season, next weeks’ draft will also be the last time where Brisbane will be able to draft from the entire state pool. The draft is the final stop on the road to the AFLW for many of the best underage footballers in the state. Across 2018, it has been a successful campaign for both the Queenslander Under 18 AFLW representative team and the seven QWAFL teams. A landmark victory over traditional powerhouse Victoria Metro, the first ever for Queensland, headlined a successful national championship as the maroon side produced six All Australians. At state level, the competitiveness of the competition continued to advance with as many as six of the competition’s seven teams vying for a place in the finals with two rounds remaining in the home and away season. A leading forward, Abbott played two games for Queensland in the NAB AFLW Under 18 National Championships despite being one year older than the bulk of the playing group. She lined up in both contests against West Australia in Perth and booted one goal in their loss to the Sandgroupers. At ground level, Abbott possesses a sharp turning circle and distinct nous for the goal face, hitting the scoreboard on 11 occasions in the 2018 QWAFL season. Abbott was also afforded the opportunity to play for the Lions in the Winter Series, playing one game for the side against soon to be rivals Gold Coast. The All Australian ruck could find her way to the Brisbane Lions after capping off a dominant 2018 season at the NAB AFLW Draft Combine last week. At 188cm, Bella is among the tallest draft prospects and could fill a need for the Lions through the middle. Unrivaled throughout the national championships, the Mackay product produced the most hit-outs across the carnival and ranked first for hit outs to advantage. One of three Queenslanders invited to the draft combine, Bella produced top five finishes in both the left and right foot vertical jump and top ten finished in the 20m sprint and the two-kilometre time trial. In her first season at QWAFL level, Brehmer was thrust into the deep end with a rebuilding Yeronga side and despite standing at just 156cm, thrived around the contest. A nimble player, Brehmer often shared time between the midfield and forward line while representing her state but operated almost entirely through the midfield for the Devils. Despite featuring prominently for West Australia at various representative levels for a number of years, Dowrick nominated for the Queensland zone given her close ties with several players in Queensland. Dowrick can play seamlessly anywhere across the ground but found a niche as a defender where she earned an All Australian guernsey at centre half back. Earlier in the season, she lined up down forward and on a wing in an exhibition match against Geelong’s VFLW side and could prove a handy jack of all trades for the Lions in 2019. As the season grew older Ellenger began to find her feet across all levels of football and by the stretch between July and August, she had established herself as one of the best ball users in the Queensland and Coorparoo sides. Ellenger operates mostly out of the defensive half but her speed allows her to push further afield. Usually calm under pressure, there’d be no wasted possessions coming out of the defensive 50 if the ball is in Ellenger’s hands. Goodwin in the latest connection in a sporting family where her dad played NBL for the Townsville Crocs and her mother represented her country at the 1992 Barcelona Olympics in taekwondo. Madison earned representative of her own this year as she held down a spot as a tall defender for Queensland at the national championships. A capable key defender, after her exposure to high levels of football this year, Goodwin has mastered when to stay tight and defend and when to leave and intercept the ball. Grider possesses the capabilities to play anywhere across the field but it’s often as an outside midfielder when she performs best. She was another of the state’s All Australian selections where she was named in the side as a defender after sacrificing much of her potency in attack to play across half-back. Grider captained Queensland at the national championships and was named Queensland’s Most Valuable Player. She represented Brisbane in the Winter Series and at QWAFL level, was crowed the Rising Star winner alongside her Team of the Season inclusion. In her first season at QWAFL level, Groves-Little claimed top honours by claiming the league Best and Fairest as her Coorparoo Kings made their second straight Grand Final. Groves-Little excels in space when she has the ability to run and carry and is capable is lining up through the midfield or as a forward. A creative player going forward, Groves-Little hit form in the national championships and continued to thrive in big games at both state and QWAFL level. Another over-age player to have represented Queensland against West Australia, Henning made the most of her opportunities in 2018 after missing out in her draft eligible 2017 season. A true running defender, Henning often was the source of much of Queensland’s drive from defence and did the same at QWAFL level with University of Queensland. At 178cm, Henning is capable of playing either as a pure rebounder or as a lockdown type. The sister of North Melbourne AFLW utility Tahlia, Brooke made a name for herself as a dependale midfielder who has the ability to impact play across half-back. While not winning copious amounts of the ball herself, Randall loves a tackles and did some on many occasions throughout the national championships, including one on Victoria Metro gun Gabby Newton that set the tone for Queensland’s eventual victory. Smith rose to the fray after starring for the Gold Coast Sunsets in October 2017 and was soon selected for the Gold Coast SUNS Academy. She again performed well against the Brisbane Lions Academy in March and again in the Northern Academy Series. An athletic tall who can play both in the ruck and as a forward, Smith’s sharp rise to representative level culminated in two games for Queensland across the national championships this year. A tall forward, Wardlaw stands at 185cm tall and boasts a significant presence inside 50. She became the vocal point of Queensland at the national championships and finished the carnival with 2.3 across her five games. Wardlaw presents strongly on the lead and the former netball talent takes a strong contested mark. Her height allows her to move into the ruck and impact games further up the ground – something she did often throughout the national champions in relief of Lauren Bella. The third Queenslander invited to the draft combine, Yorston is among the biggest Queensland prospects this season. A genuine contested midfielder, Yorston collected a team-high 19 disposals in the state’s historic win over Victoria Metro and doesn’t shy away from the physical facets of the game. Yorston showed resounding perseverance throughout the QWAFL finals series, playing through a shoulder injury to play a role in Wislton Grange’s maiden senior women’s premiership. The 2018 NAB AFL Women’s Draft will take place next Tuesday, October 23 at Marvel Stadium in Melbourne; commencing at 12pm AEDT. The Brisbane Lions will hold picks 9, 22, 33, 45 56 and 61 in the Draft. Note: This article reflects the opinions of the author and not that of the Brisbane Lions AFLW team.